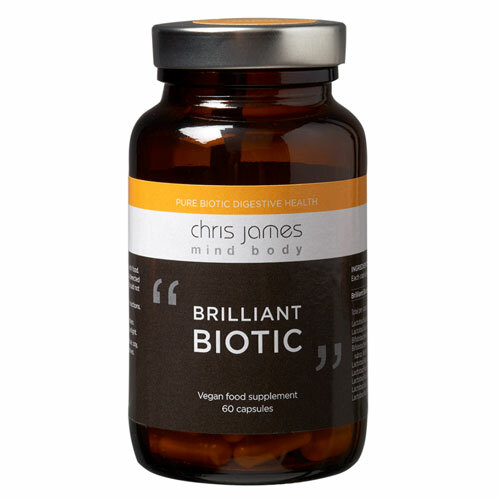 Chris James Mind Body Brilliant Biotic Digestive Health is an everyday probiotic, that was formulated in partnership with the world’s foremost producer of superior quality probiotics and together they`ve created a truly brilliant probiotic. Each dose of “Brilliant Biotic” nourishes you with 15 Billion micro flora containing 16 viable strains that have been subjected to rigorous scientific study and are proven to be effective. Why 16 strains and not more? At Chris James Mind Body we believe that quality always trumps quantity and you can be assured our 16 viable strains are of the highest quality and backed by solid scientific research. When it comes to health supplements, more is not always better. Silica, Live Microorganisms, Lactobacillus acidophilus CUL–60, Lactobacillus acidophilus CUL–21,Bifidobacterium bifidum CUL–20, Bifidobacterium animalis subsp. lactis CUL–34, Lactobacillus salivarius CUL–61, Lactobacillus paracasei CUL–08, Lactobacillus plantarum CUL–66, Lactobacillus casei CUL–06, Lactobacillus fermentum CUL–67, Lactobaciilus gasseri CUL–09, Bifidobacterium animalis subsp. lactis CUL–62, Bifidobacterium breve CUL–74, Streptococcus thermophilus CUL–68, Howaru® Lactobacillus acidophilus NCFM™, Howaru® Bifidobacterium lactis HN019, Howaru® Lactobacillus rhamnosus HN001, Capsule shell: Microcrystalline Cellulose. Below are reviews of Chris James Mind Body Brilliant Biotic - 60 Capsules by bodykind customers. If you have tried this product we'd love to hear what you think so please leave a review. 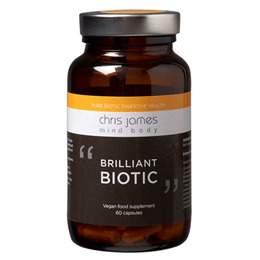 Chris James Mind Body Brilliant Biotic Digestive Health is an everyday probiotic.